New New New - so many new items to see, use, have and love. You know where you can get them right? There here! Stampin' Blends. And are they ever awesome. The more I use them the more I fall in love with them. 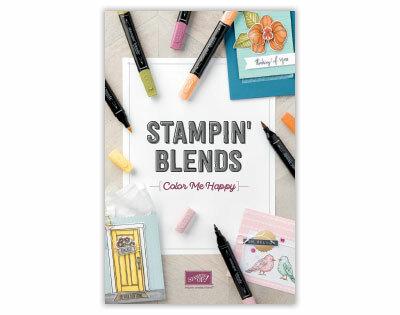 Why are Stampin’ Blends not packaged together as a collection? Because all the Stampin’ Blends markers are sold singly—and because the marker offering will continue to grow with future publications (which means the offering will continually change)—Stampin’ Blends are not packaged as a “collection” or discounted when you purchase all of them. In fact, the initial collection item number was only created for ease of ordering—so you could avoid entering numerous item numbers to order every Stampin’ Blend currently available. By packaging them as singles, you can order the exact markers you want in the quantities you want. We made the decision to provide a low-cost, high-quality marker that could easily and economically be replaced without having to worry about purchasing ink refills or nib replacements. And again, by offering them singly, you can purchase individual replacements, as needed. See the new brochure here!